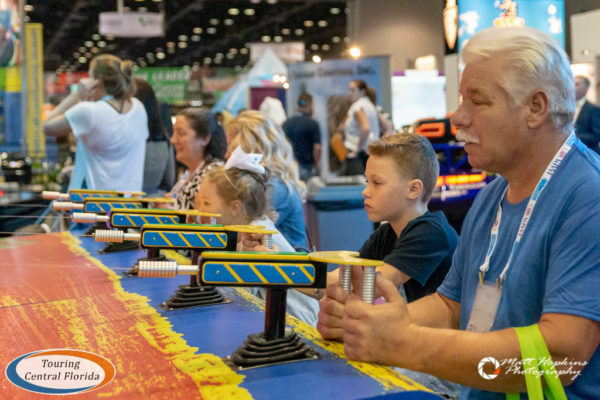 The 2018 International Association of Amusement Parks and Attractions (IAAPA) Expo was recently held in Orlando, where over 1100 exhibitors from around the world showcased their products and services to industry professionals. 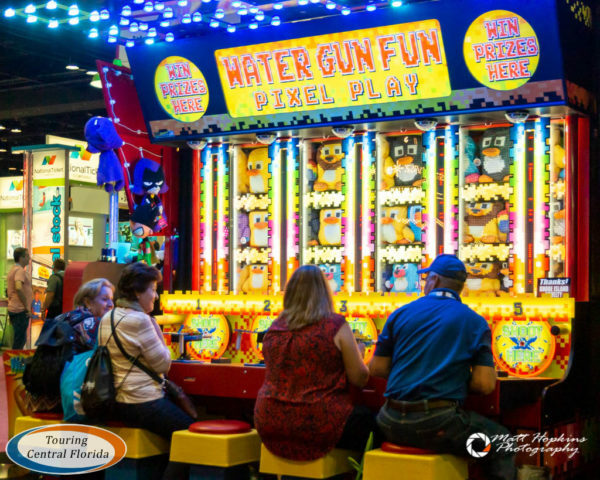 Being that Orlando is widely considered the theme park capital of the world, it should come as no surprise that many of the companies that create the experiences within the attraction industry are based right here in Florida. 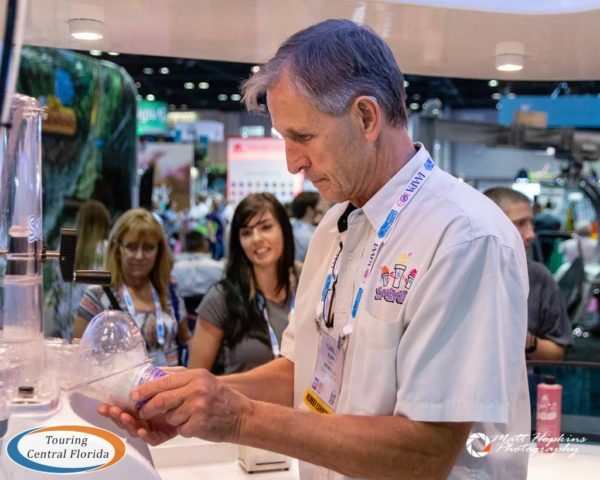 Many more companies from across the globe have their products and services in the parks and attractions across Central Florida. 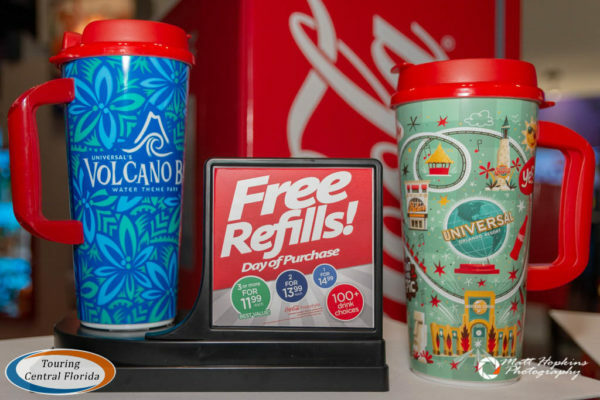 Those products and services range from the huge roller coasters guests ride to smaller implements like the park maps and souvenir cups. 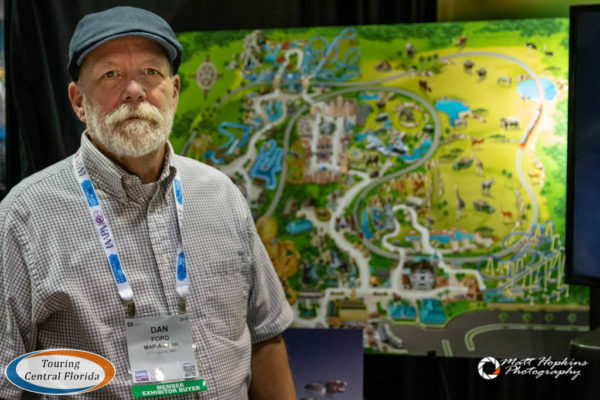 While to most guests a visit to a theme park or similar attraction in Central Florida is one seamless experience, it really takes hundreds of different companies to supply a number of components to make that visit what it is. 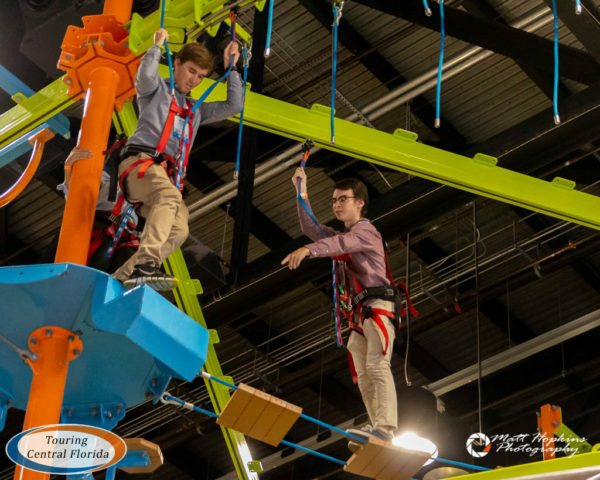 Calling Orlando home, Skyline Attractions keeps growing each year and has recently seen success in installing its first major attraction in a theme park. 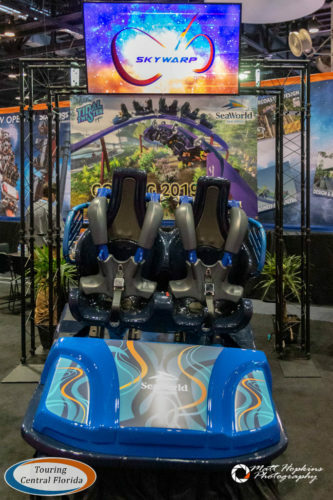 This year at the IAAPA Expo, Skyline Attractions unveiled a car for their first installation of their Horizon model of their Skywarp roller coaster. 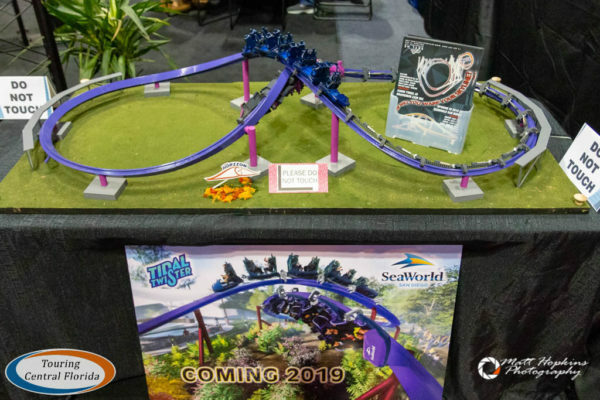 Tidal Twister will open in 2019 at SeaWorld San Diego. 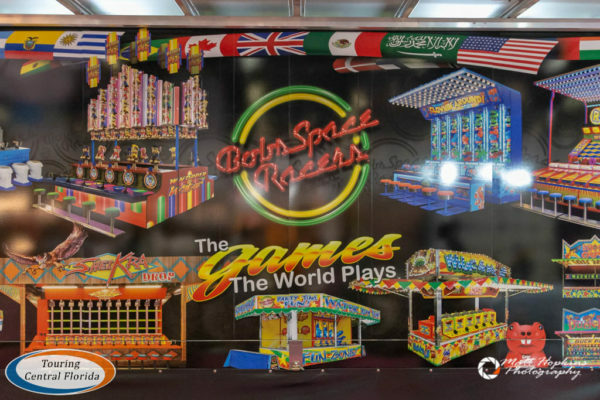 Bob’s Space Racers, based in Daytona, always has quite the impressive set up at the IAAPA Expo. 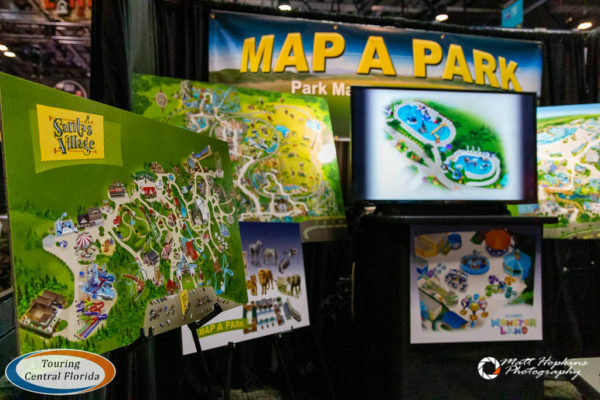 The company specializes in games of all sizes, several of which you can find in the theme parks in Central Florida. 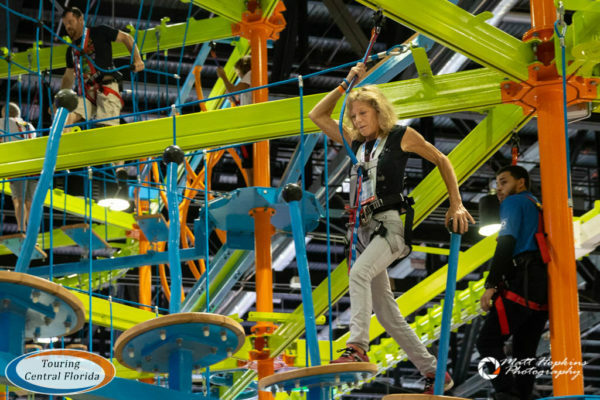 Always a popular exhibitor at the IAAPA Expo, Ropes Courses Inc. brings a huge set up of their Sky Trail system each year. RCI has several of their courses in Florida, including at the Museum of Science & Industry (MOSI) in Tampa. 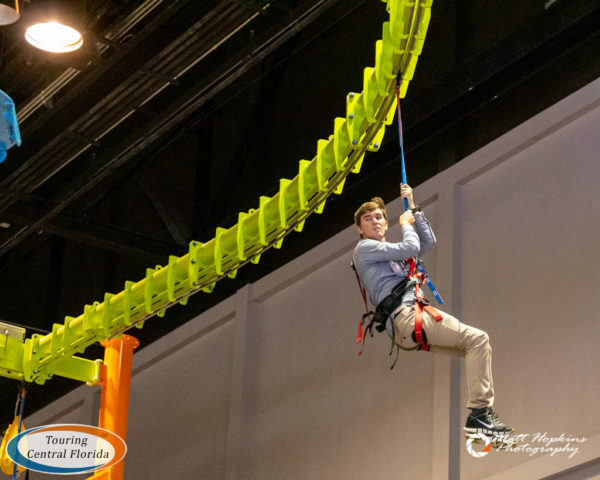 Touring Central Florida correspondents Emmet and Jacob both enjoyed their time at Ropes Courses Inc’s booth this year, testing out their Sky Trail and rock climbing walls. 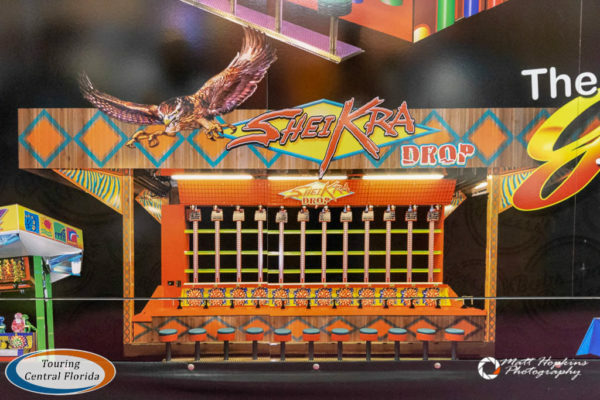 This was the first year that Feld Entertainment had a booth at the IAAPA Expo. 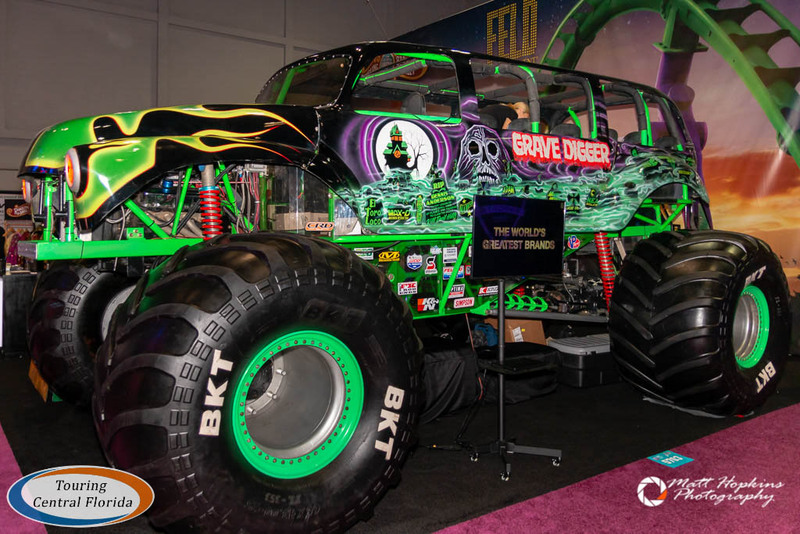 Based in Sarasota, Feld is home to some big name properties like Monster Jam. 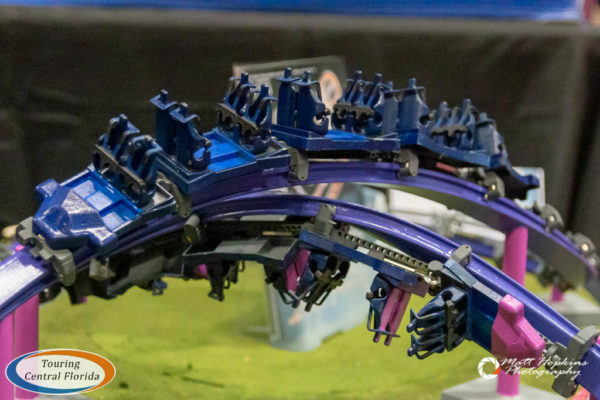 One of the concepts introduced at IAAPA was for a Monster Jam themed roller coaster, though the announcement didn’t include any details on where the coaster might be located. 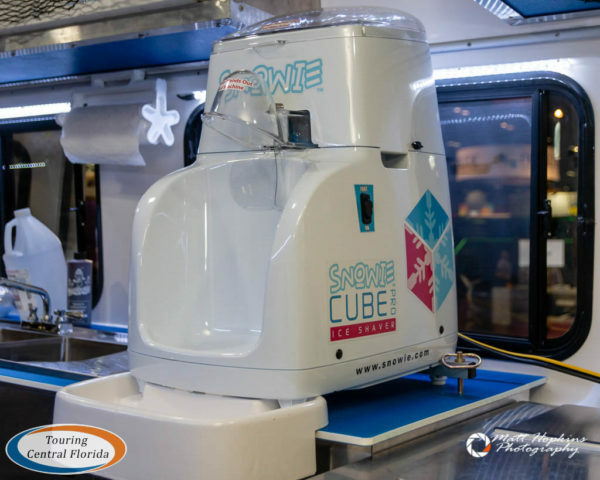 If you enjoyed shaved ice, then Snowie’s is your dream provider. The equipment they offer includes true ice shaving, from large blocks of solid ice! They also offer a set up to allow guests to choose their own flavors of syrup. 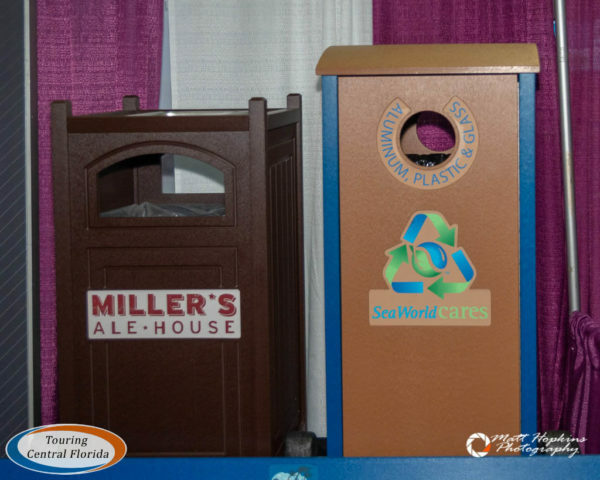 Their products are in attractions and parks around the country, including at SeaWorld’s properties in Orlando. 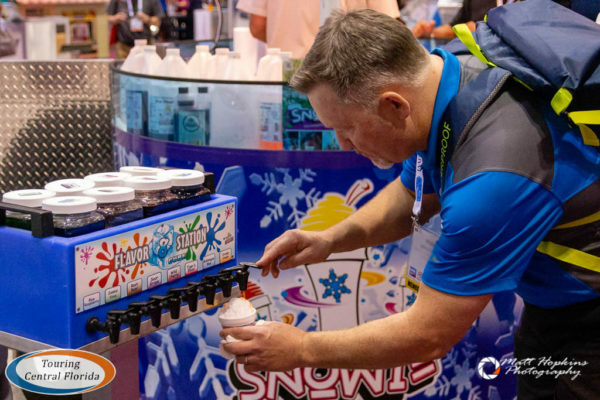 After our visit to the booth, we also heard buyers from the Walt Disney Company stopped by and purchased two of Snowie’s units. 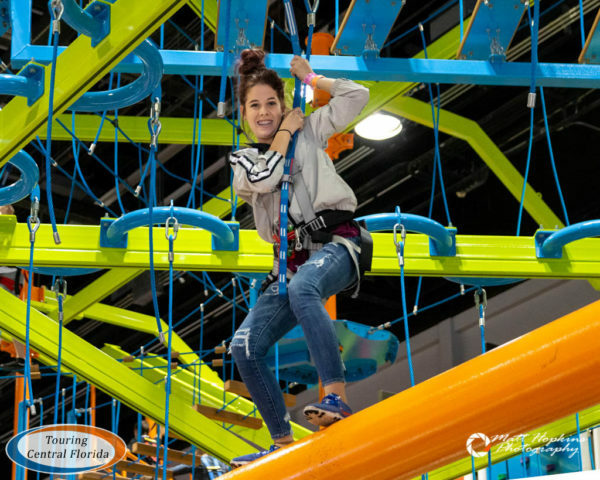 It’s not just the rides, attractions and treats that companies at the IAAPA Expo bring to the table to make your theme park experience complete. 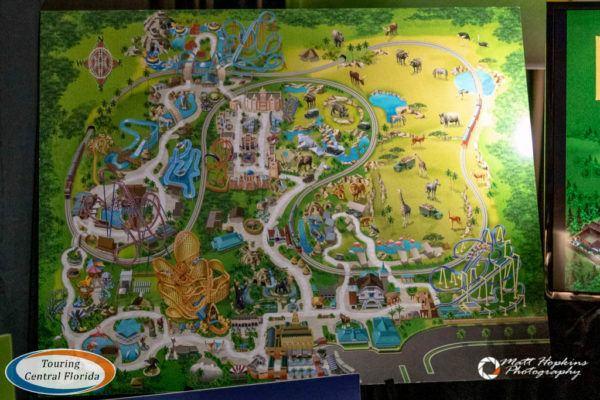 When you pick up a map when you visit a park or attraction, do you ever wonder who made the illustrations for it? If you visited a Busch Gardens or SeaWorld park (among others), then you’ve probably held the art of Dan Ford in your hands. 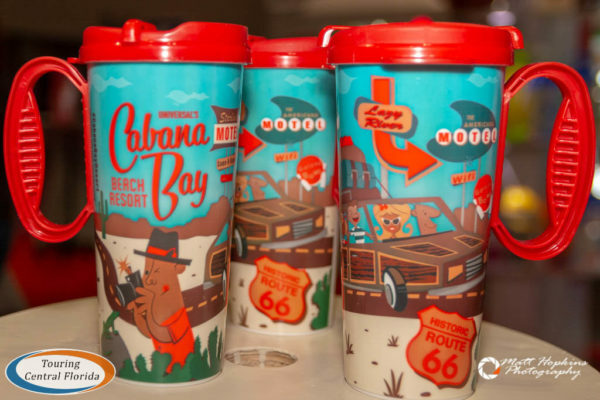 If you’ve purchased a refillable mug in a park before, there’s a good chance it’s from Whirley-DrinkWorks!, which provides cups and other items for a number of parks and attractions, including Universal Orlando and SeaWorld & Busch Gardens properties. 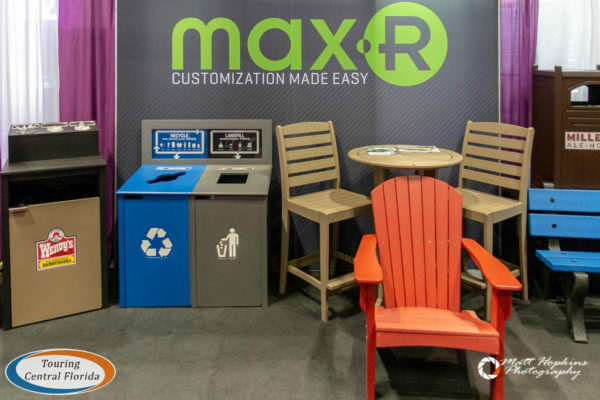 And if you’ve been a responsible guest and thrown away your trash and recycled what you can when visiting a park, you might recognize these receptacles from Max-R. Many components of parks you may not even think of are all provided by different companies, too. 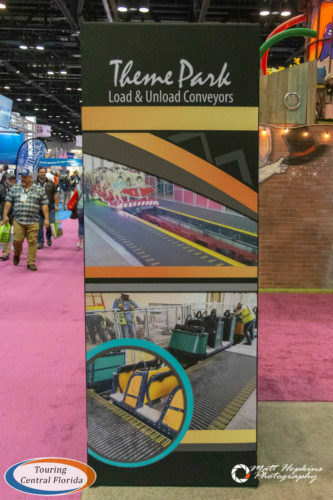 Magic Carpet Lifts has provided a number of the conveyor systems at parks across Central Florida. If you’ve ridden on Cobra’s Curse at Busch Gardens Tampa Bay, you’ve walked on their conveyor belt in the station. If you’ve enjoyed one of the slides at the local water parks, chances are the conveyor that carries the raft to the top was provided by Magic Carpet Lifts as well. 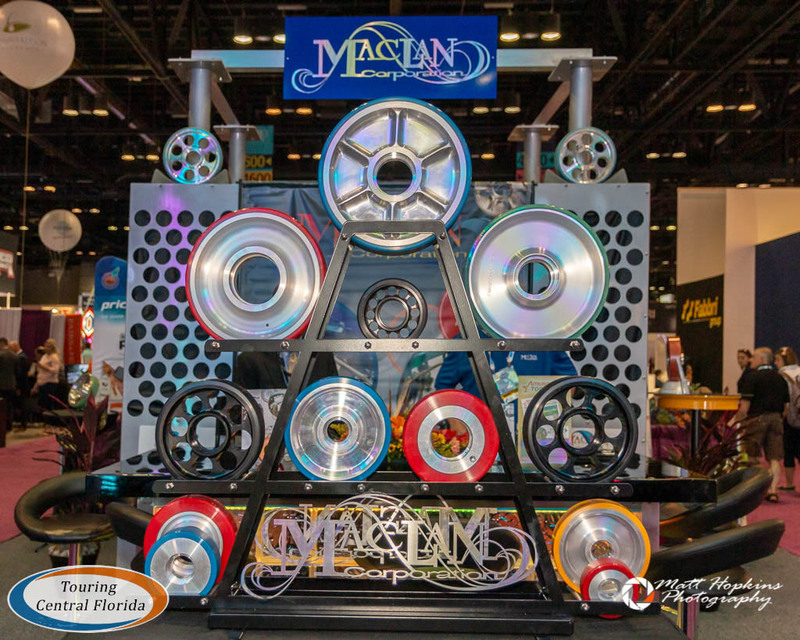 If you’re a roller coaster fan, then there’s a good chance you’ve used the products from Maclan Corporation, who manufacturer wheels for coasters and other attractions. 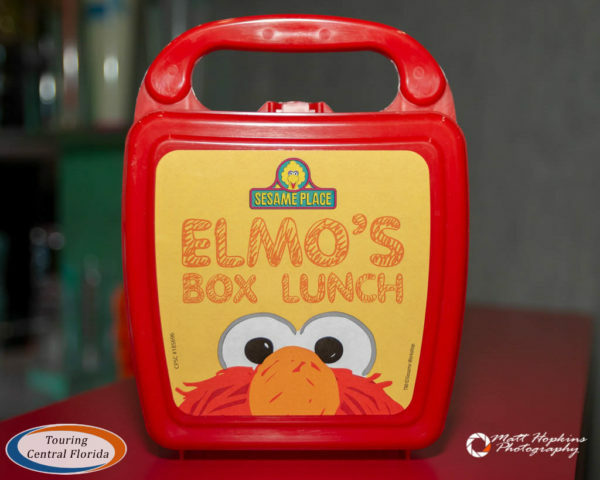 The company is based out of Lakeland, Florida. Sometimes you don’t even see what the company provides to enhance your visit to an attraction, where their product or service is technology based. 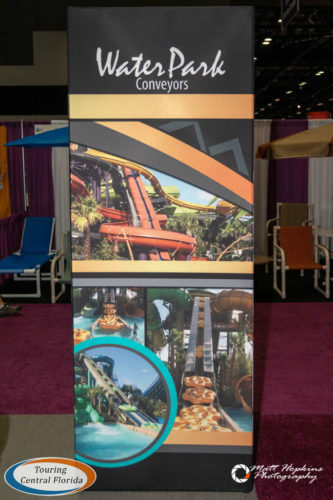 A company like Picsolve, that has offices in Orlando, a retail imaging company which includes photography and videography services at theme parks and attractions across the globe, including LEGOLAND Florida and Kennedy Space Center. 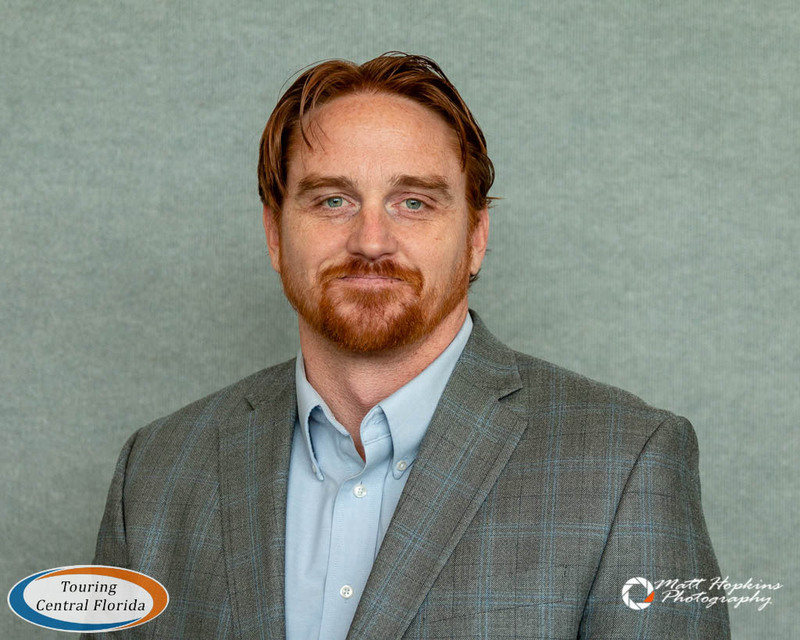 Although they didn’t have a booth at this year’s expo, we caught up with Picsolve’s John Barbieri, Head of USA Region and Chief Operating Officer at the expo. 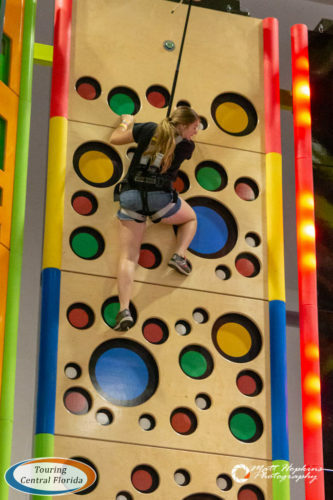 At LEGOLAND Florida, they provide services for about a dozen different photo spots, including on-ride pictures, the Driver School licenses, and character meet and greet photos. These companies are just a small fraction of the providers of products and services that make a visit to a theme park, zoo, museum, etc. what it truly is – a complete experience that guests get to enjoy. 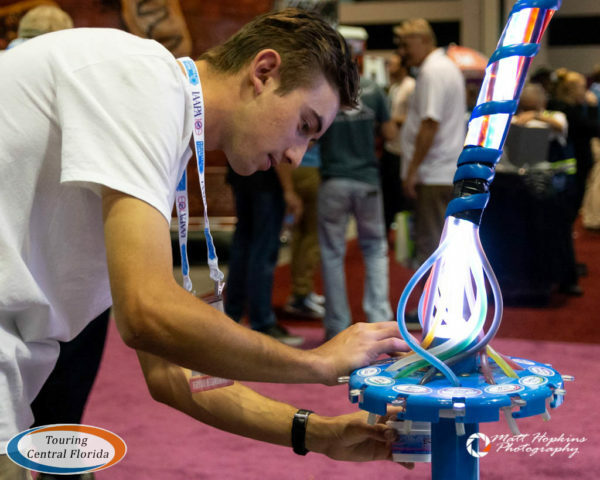 The IAAPA Attractions Expo in Orlando each year gives us all a glimpse into just how many organizations and hard working individuals it takes to craft that experience each and every day. Special thanks to photographer Matt Hopkins for the images used in this article.